AUSTRALIA - we're in for a scorcher in the coming week. With the mercury set to soar above 30C across all capital cities, except Hobart, in the days ahead, Aussies are urged to slip, slop, slap and stay out of the heat. Even Tasmania won't be far off the 30C mark. "Over the next couple of days there will be a high pressure system influencing the state with pretty warm conditions. From Tuesday onwards it looks like we have got a low intensity heatwave developing, and by Thursday it will be a severe heatwave in parts of the state. "There will be clear skies as well, which means things will heat up." "The hottest day in Sydney will be Thursday, and we're forecasting 34C (and hotter in the west). On Friday it will cool down to 27C because we have a southerly change moving through that will cool things down a bit," she said. 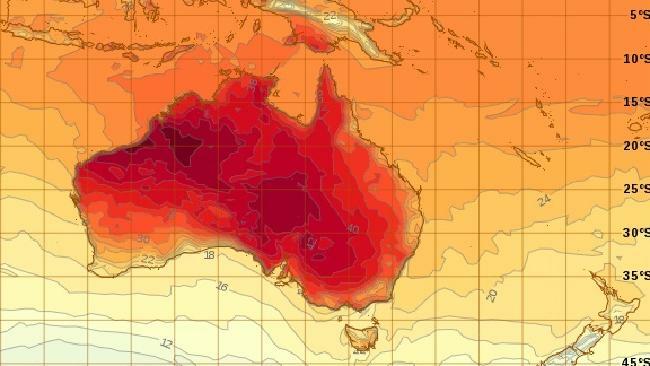 "Even on Friday in the west of NSW it will still be quite warm. On Saturday it's heating back up with 33C in Sydney." It's a trend we'll see happening Australia-wide this week, with all states and territories in for 30C or warmer except Tasmania. The nation's capital is set to swelter this week, with a low of 30C on Monday followed by five days of temperatures in the low to mid 30s. It will hit a peak of 34C on Thursday, followed by showers until Saturday. Hobart will be the only capital that doesn't reach the 30 degree mark, hitting a high of 29C on Wednesday. Temperatures will stay in the mid 20s for most of the week.